Someone recently left a comment asking what kind of varnish I used and I realized that I’ve never really talked about varnish very much. So, here it is, THE POST ABOUT VARNISH. I go through a LOT of varnish, using most of it on my signs. On my furniture I typically only varnish the TOP or areas that need the extra protection. Why NOT just varnish the whole thing? I like to leave my things with the capacity to continue to ‘additionally distress and age naturally’. I ONLY USE WATER BASE PAINT PRODUCTS; INCLUDING VARNISH. The product I buy says on the label “CLEAR MATTE FINISH”. Then water thinned acrylic-urethane. I’m guessing this differs from POLYUrethane in that poly is most likely an OIL based product. 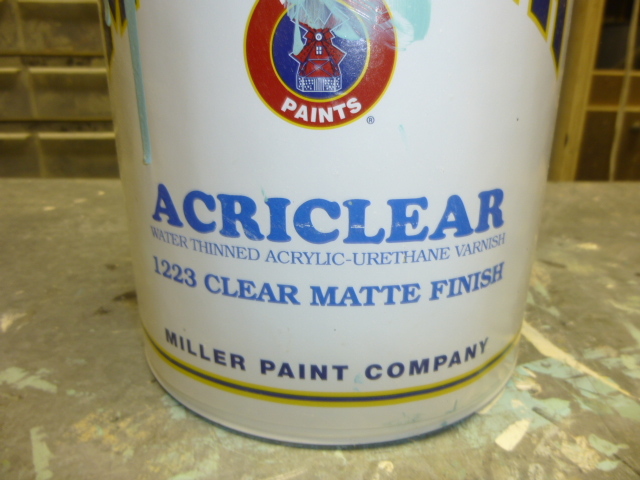 Since I go through so much of it, I buy my varnish by the GALLON from Miller paint stores. (I think Miller might be a NW only paint store) Really ANY brand will probably be fine. What ‘makes the difference’ is the ‘sheen level’ you get. Glossy, satin or matte. I ONLY use matte finish, which has the LEAST amount of sheen to it. The less amount of sheen, the less dust and scratches will show up. If a glossy table gets scratched, you are REALLY going to notice it. If a matte finish table gets scratched (especially if it is distressed!) the scratch will barely be noticeable. Shiny and glossy surfaces are much harder to photograph too . . . .you’ll always have that darn GLARE to deal with. Also, matte finishes require less (if ANY!) prep work (sanding or priming) when and if you ever decide to re-paint. New paint just does ant adhere well to glossy, slick surfaces. I know I’ve mentioned that many times when giving shopping tips. I think the last time I bought a gallon of varnish it was over $80.00 (yes EIGHTY!) but hat will last me close to a year, and much more economical than buying a quart every four months. BUT, it does tend to ‘settle’ quite a bit and require a VERY good stirring before use if it has sat unused for very long. BE SURE to ask the paint store to ‘shake’ your can of varnish (like they the paint). They WILL frown at you and advise you NOT to and tell you that it will cause bubble in your varnish; which it MIGHT, IF you are going to use it right away. I made the mistake of NOT having them shake the first gallon I bought and the ‘stuff’ at the bottom was SO thick and hard that I never was able to ‘mix it in’. And as I already said, it will re-settle pretty quickly. 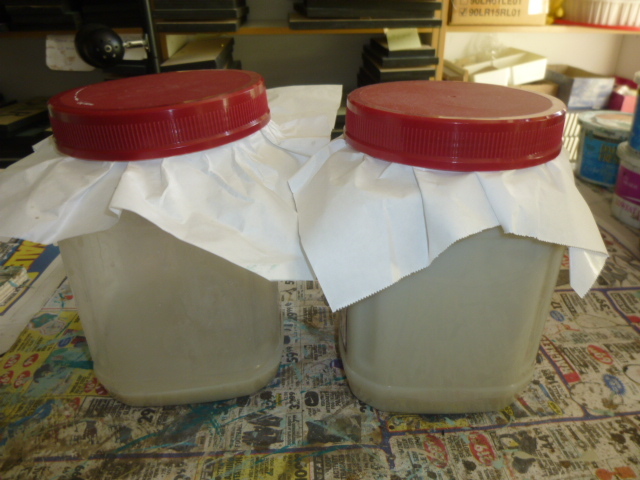 To minimize the amount of hand stirring I have to do AND to better insure the proper mixture (of the stuff that settles to the bottom) throughout my entire gallon of varnish; as soon as I bring a new gallon home, I pour it into 3 or 4 smaller plastic containers with screw on lids. AND place a piece of was paper or freezer paper over the top of your jar before you screw your lid on. That will keep it from getting ‘glued on’ and make it much easier to remove. And since the portions are smaller, it’s easier to stir up the gunk that settled on the bottom. And that is everything I know about varnish! I too was going to ask you about varnish. Do you actually use a varnish or a polyurethane product? Most everything now seems to be called polyurethane. It gets confusing. If you have the time, I would SO appreciate your input! I am trying to find something to seal some indoor signs I have painted with craft paint – something that won’t yellow my whites, but will help some of the colour “pop”. I see you are using a clear matte acrylic urethane varnish, but I can’t seem to find anything like that in Canada! Oh I’m so confused. Urethane, polyurethane, waterbased…oh the search has lasted days and hours! Everything online tells me to use artist sealers on acrylic paint, but maybe I like to see more bang for my buck than a tiny little artist jar for $10! While I can’t really help you with finding the right product in Canada, I can tell you what to look for. I use a basic WATER based matte varnish, which I buy at the paint store. The label says that it is “water thinned acrylic-urethane varnish”. I buy it by the quart and I buy SEVERAL quarts ‘when I can find it’ BECAUSE the matte finish can be hard to find. One tip I will share is to be sure to ask them to ‘machine shake the can’ (Like they do to mix paint colors) They will advise you to NOT do that. They will say it will make your varnish all ‘bubbly’. But as long as you can ‘let the shaken can sit for a while to settle’ before you use it; you will be fine. I made the mistake of NOT having the first can I bought shaken and some of it was SO settled at the bottom that I was never able to get it to mix in and had to throw away about 10% of the product. If all else fails, matte finish ModPodge will work the same as the matte varnish; but it’s kind of pricey. Although I have been finding the little 2oz. bottles of Mod Podge (name brand even!) at my local Dollar Tree stores.